One of the best – or worst – things about cyclocross is the ever-changing weather. The season starts in summer and ends in mid-winter, which makes unpredictable changes common and extreme race conditions always expected. But this weekend's frigid cold in Bend, Oregon made racing even more severe than usual and the tough-as-nails cyclocross racers were tested to their max. 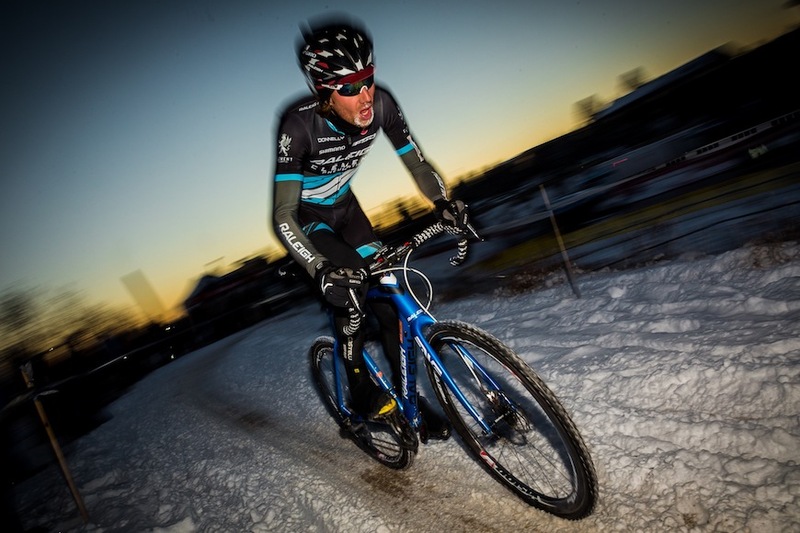 The event was the Deschutes Brewery Cup, the final UCI category one race on USA Cycling's Pro Cyclo-cross Calendar. An arctic blast pushed race day temps to 5 degrees Fahrenheit and dropped six inches of snow before the race. Bend’s normally fast course became super technical, as hard-packed snow and ice made every corner a challenge, steep hills unrideable and passing difficult. In addition to bike-handling skills and pure power, the racers also needed experience and creativity in choosing clothing and gear that would protect from the cold, but that would also allow enough movement and dexterity to ride fast. But maybe most importantly, the extreme conditions demanded mental toughness and focus. The Raleigh-Clement team proved up to the chilly challenge, putting all three guys in the top 10. The team was lead by Jamey Driscoll, who used his cornering skills and ruggedness to land on the podium in third place behind Tim Johnson and Geoff Kabush. Although Jamey is only 26, he is one of the most experienced riders on the circuit, as the 2003 U.S. Junior National Champion and a member of seven U.S. World Championship Teams. Plus, Jamey grew up in Vermont where ski racing and cycling in sub-zero temps are common, and he proved once again to be one of the most consistent riders when conditions are dicey. His pre-race interview showed he was ready for the challenge. Team rider Allen Krughoff delivered an excellent seventh place, matching his best result ever, and Ben Berden finished in eighth. Allen is from Colorado and feels somewhat comfortable with the wintery stuff, as he said in his post-race interview. On the other hand, Ben is from Belgium, where the lowest temperature ever recorded is a balmy 9 degrees Fahrenheit and rarely drops below freezing. Now is also a good time to give a high-five to the team staff. When conditions are extreme, team support becomes even more critical, but harder to deliver. These guys are true professionals, seen by their dedication and attention to detail. At least they didn't have to wash race bikes this weekend, as the frozen ground meant bikes finished as clean as when they started!